Blowout Sale! 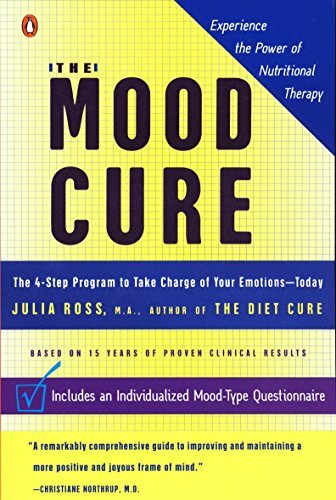 Save 54% on the The Mood Cure: The 4-Step Program to Take Charge of Your Emotions--Today by Penguin Books at Book Sellers Union. Hurry! Limited time offer. Offer valid only while supplies last. Are you a part of the bad mood epidemic? Here are the answers you've been looking for! Julia Ross’s plan provides a natural cure for your mood. Julia Ross’s plan provides a natural cure for your mood. Drawing on thirty years of experience, she presents breakthrough solutions to overcoming depression, anxiety, irritability, stress, and other negative emotional states that are diminishing the quality of our lives. Her comprehensive program is based on the use of four mood-building amino acids and other surprisingly potent nutrient supplements, plus a diet rich in good-mood foods such as protein, healthy fat, and certain key vegetables. Including an individualized mood-type questionnaire, The Mood Cure has all the tools to help you get started today and feel better tomorrow.